BEIJING, Feb. 27 (Xinhua) -- China's top legislator has called for concerted efforts towards holding a successful annual legislative session in March. 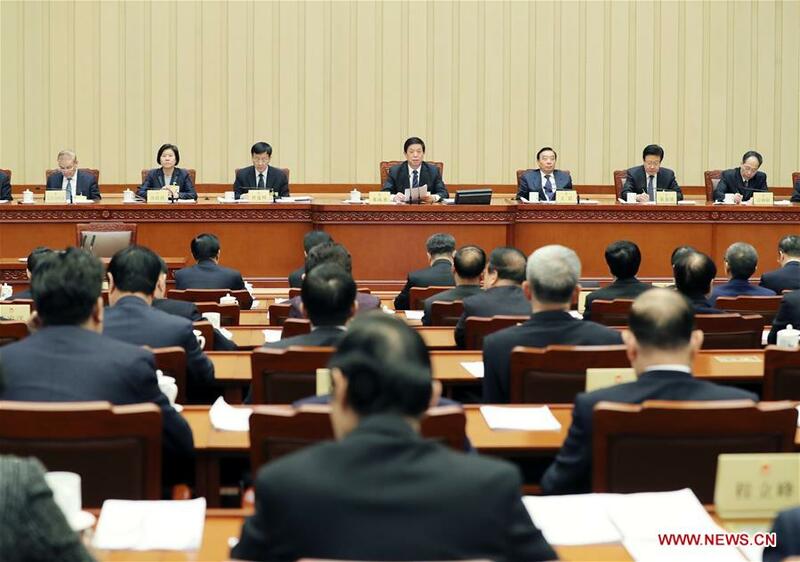 Li Zhanshu, chairman of the National People's Congress (NPC) Standing Committee, made the call at the closing of the committee's bimonthly session on Wednesday. Li said the committee's work report had been deliberated on and endorsed in principle at the session. The report is now expected to be submitted to second session of the 13th NPC for review. The top legislator also spoke about the two reports that had been deliberated on at the session -- one on the battle to control pollution and the other on the fight against poverty. Lawmakers have taken note of progress made on both fronts, Li said, calling for more efforts to help improve the environment and advance poverty alleviation. Li said the upcoming second session of the 13th NPC was a key meeting and would help bring people's mind and action in line with the decisions and plans made by the Central Committee of the Communist Party of China and rally people to work together to accomplish various tasks of the year to celebrate the 70th anniversary of the founding of the People's Republic of China with great achievements. Li stressed the spirit of democracy, unity, result-seeking and striving for the progress of the annual legislative session.